Welcome to a step-by-step SERPWatcher guide where you’ll learn how to get the best of rank tracking. 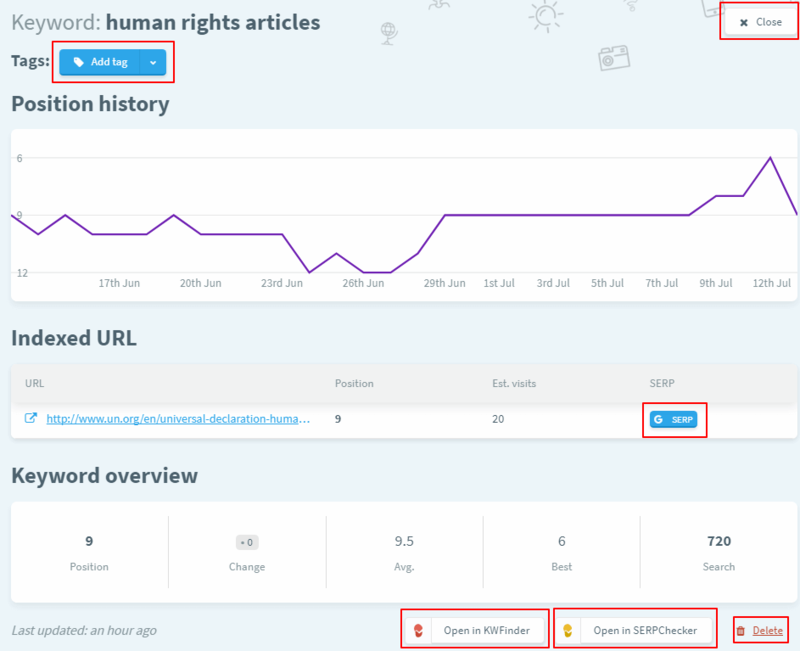 Read this guide and enjoy SERPWatcher’s data in a user-friendly interface. 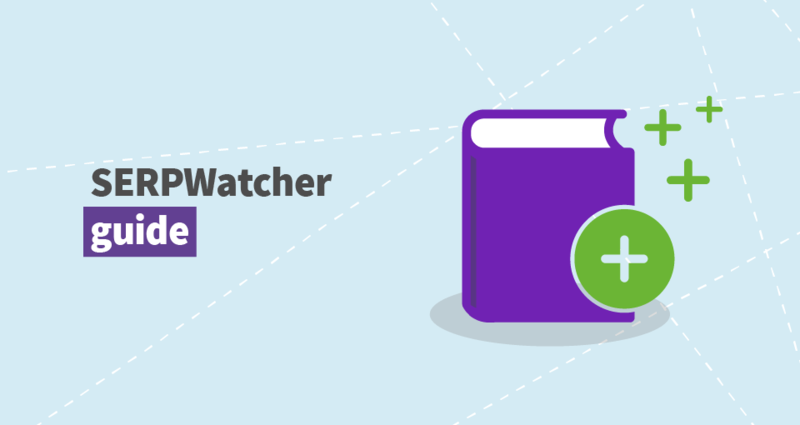 Don’t forget to check all SERPWatcher features and videos to see how they help you in rank tracking. 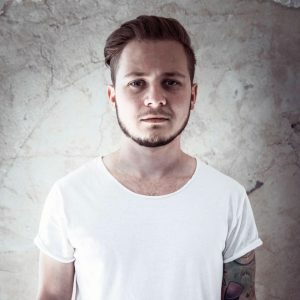 Are you new to rank tracking? Read the “What is rank tracking?” article which is part of our SEOpedia. You can split the keywords into an unlimited number of domains. In case you use the free plan, you’ll get access to interactive SERPWatcher DEMO trackings where you’re able to test all the features. The demo trackings are real domains with real keywords. Therefore, they come with real and daily updated data. Same as in your own tracking. You can experience how creating a new tracking works as well. 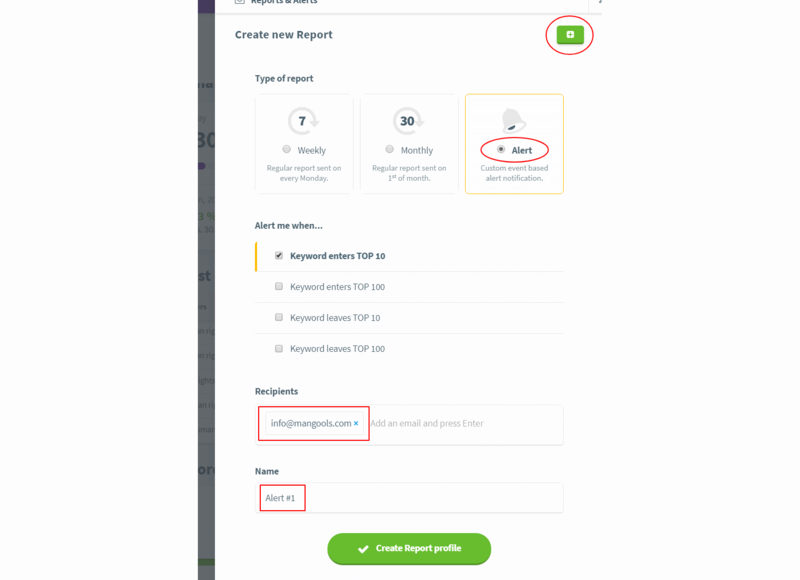 Just log into your mangools account and you’ll land on the “Add new tracking” page. If you already have created tracking(s), you’ll land on the “Trackings” page. There’s also an option to add more or delete keywords later when the tracking is active. This page shows all trackings with basic information and the Dominance Index progress. To visit the section, click on “Trackings” in the header area of the app. To open a tracking, click anywhere on the white tab area. 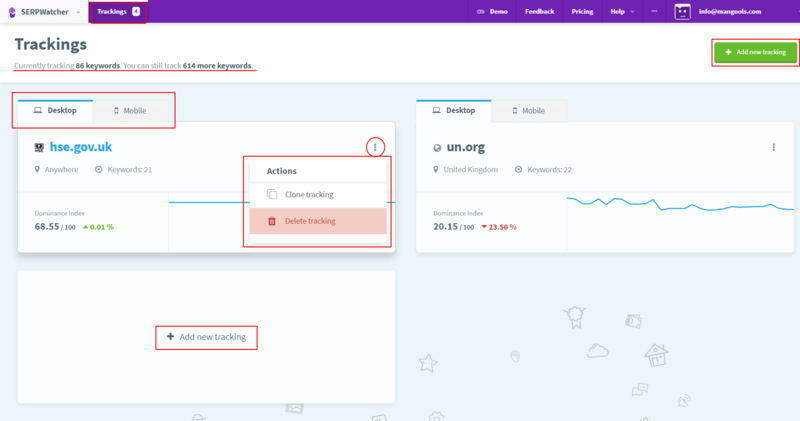 It’s basically an overview of all tracked domains with options to clone or delete the tracking by clicking on the three dots menu in the upper-right corner of each tracking tab. You can switch between desktop and mobile results here as well. 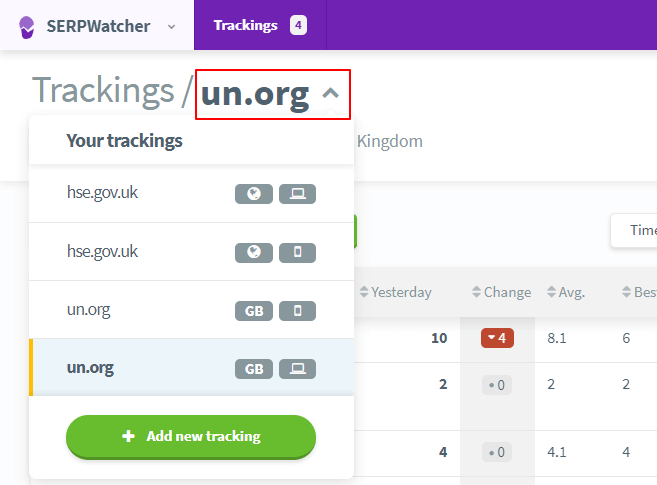 If you want to create a new tracking, click on the green button “Add new tracking”. When you’re cloning the tracking to start tracking another type of search results (desktop/mobile), all keywords added to both trackings will be counted as 2 tracked keywords. This is caused by getting 2 different SERPs for 1 keyword. Another option to find the trackings or create a new tracking is from the “Dashboard”. The SERPWatcher dashboard is designed to provide all data on one screen thanks to a two-column interface. The left column is dedicated to keywords, position changes, and search volumes. You can select from the desktop or mobile view to see both results immediately. The chart comes with the “Yesterday” (current) position of a keyword, “Change”, the “Avg”, the “Best” position and the search volume. The data is based on the selected time frame. In other words, the results change as you select different time frames. 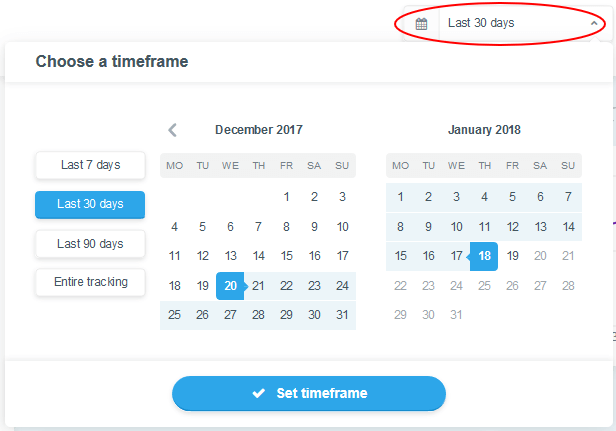 You can select your own time period or select one of the default ones. Would you like to export the tracked keywords? No problem. Tick the ones of your interest and click on the blue button “Export” right below the table. 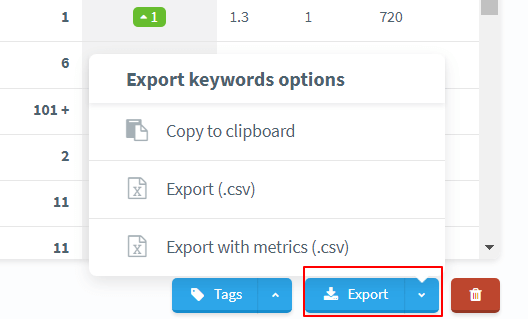 You can choose from “Copy to clipboard”, “CSV Export”, or “CSV export with metrics”. When you want to see specific keywords, the filter feature is handy. Just click on the button “Filter keywords” right above the keywords table. There are plenty of options to choose from. Once done, click on the green button “Set filter”. This is the place where you’ll find all the metrics and charts. The Dominance Index is an aggregated metric that represents the organic traffic share based on current positions and weights of the keywords. It’s indicated on a scale from 0 to 100. The higher the value, the more you dominate the organic traffic. There are two tables with top rankers and top outrankers with their current position, its change and the Estimated visits change. This way, you’ll get a quick insight into top changes of the tracking. SERPWatcher sorts the numbers by the Estimated visits change. Yet another global and useful report. It represents how many keywords of the tracking went up, went down, or remained unchanged. 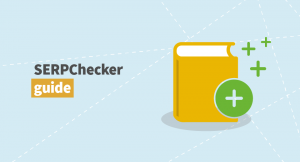 We’ve introduced the metric in our other tool, KWFinder. The calculation is based on the average CTR of the current SERP position of a particular keyword. Let’s say “keyword A” is on 1st position. The avg. CTR for this keyword on 1st position is 0,30%. The monthly search volume of this keyword is 10,000. 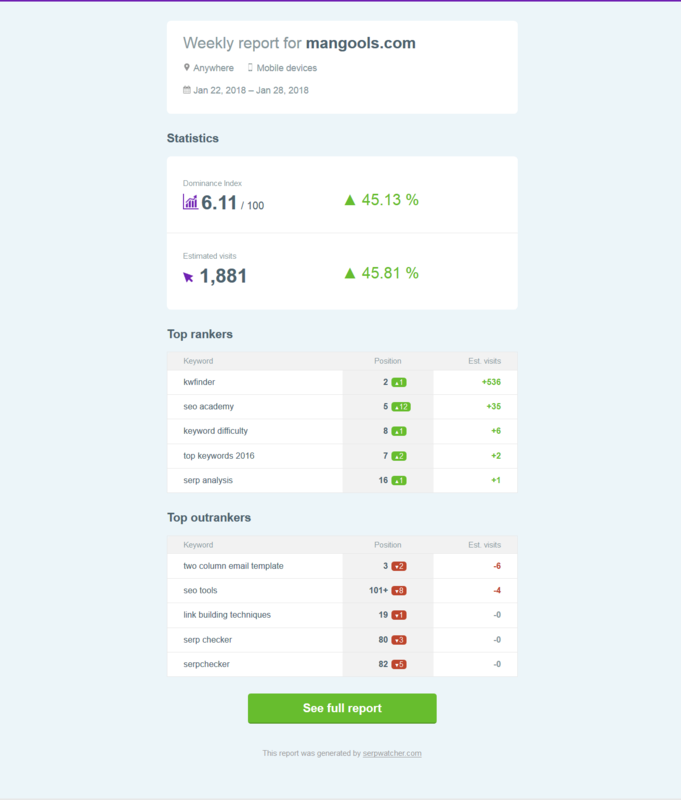 The Estimated visits per month for “keyword A” on 1st position will then be 3000. This is the count and percentage of keywords in 6 various position categories. We use graphics to display the data so you’ll obtain an overall view how well the tracking stands. The data of all metrics are based on the selected time frame. In other words, they change as you select different time frames. To open the keyword detail, click on any tracked keyword. You can close it by clicking on the button “Close” in the upper-right corner. Tags keep things organized. Keywords tracked in one tracking are usually a mix of various categories, such as website sections. Agencies, e-shops, more complex websites, or blogs are great examples. By using tags, you can group the keywords into various categories of your choice. To add tag(s) to a keyword, click on blue button “Add”. To remove tag(s) from a keyword, click on “Remove” in the left column or on “X” in the tag area in the “Keyword detail”. When you click on “Create new tag…” it will guide you through. 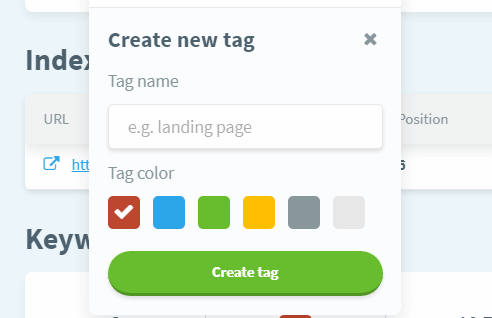 Write down the name of the tag, choose the color and hit the green button “Create tag”. 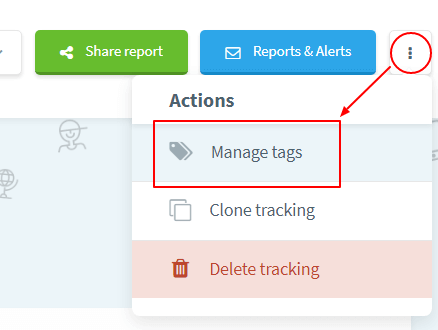 Open the Manage tags menu by clicking on the gear wheel showed in the “Tags management screenshot” or from the upper-right corner of the tracking as showed in the screenshot below. In this menu, you can see all tags, rename or delete them. 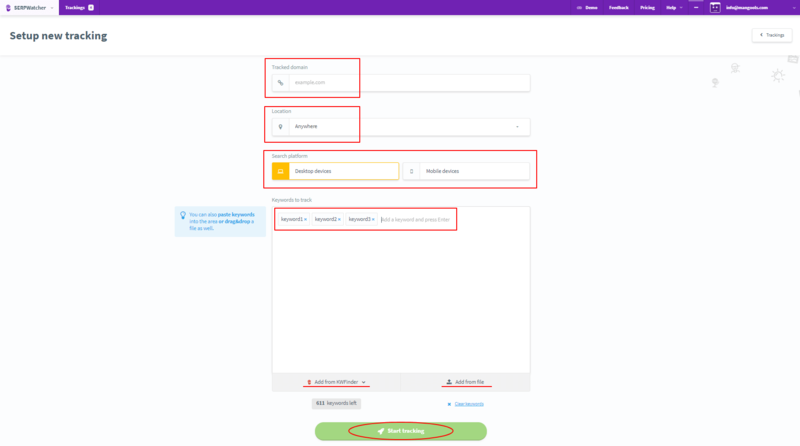 To make it easier for you, there are tag squares next to each keyword in the left column of the dashboard so you can immediately find whether a keyword belongs to one of the tag groups. 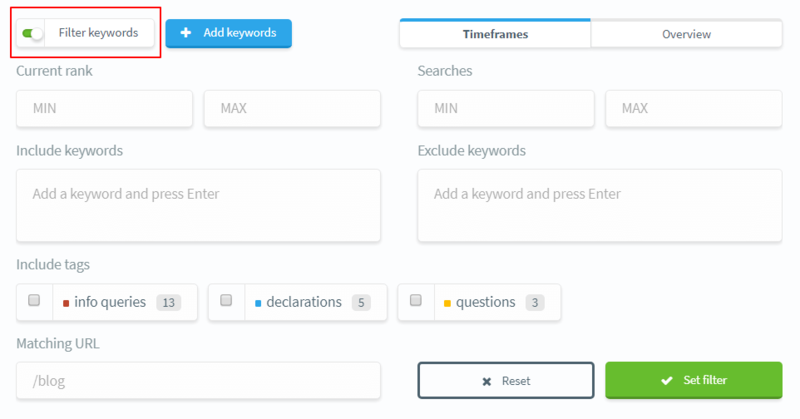 What’s more, you can you can review tagged keywords by using the “Filter” feature. Reporting is an inevitable part of SERPWatcher. One of the main aims of the tool is to make position tracking a time-effective SEO activity. That’s why we came up with interactive online reports instead of out-of-date PDF files. Besides saving time, it helps the environment. 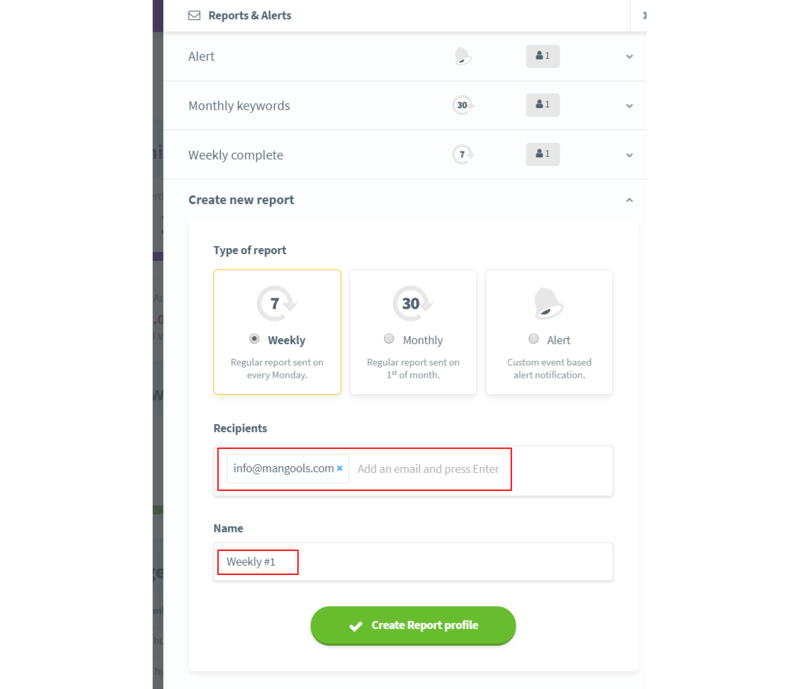 Sharing a report is a two-click effort. While in the dashboard, click on the green button “Share tracking” in the upper-right corner. A window will appear. Copy the link or directly open the report by clicking on the blue icon with an arrow. This is how you can share the tracking with your clients, colleagues or anyone else. What’s more, users can adjust the main time frame to identify how the tracking evolves in time. Click on the blue button “Reports & Alerts” in the upper-right corner. That’s it. We’ve come to an end of the SERPWatcher guide. If you have any questions or tips what to include in the guide, feel free to share them in the comments below. In case you still have troubles using SERPWatcher, don’t hesitate to ask via live chat or email. Ready? Go ahead and try all features in the app. Go ahead and try LIVE demo with real and daily updated data.